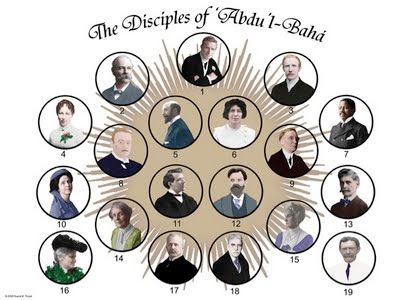 Now that William Hoar has been mentioned, I must include some information on the Disciples of ‘Abdu’l-Bahá. Not that Lua Getsinger and Joseph Hannen haven't been mentioned! 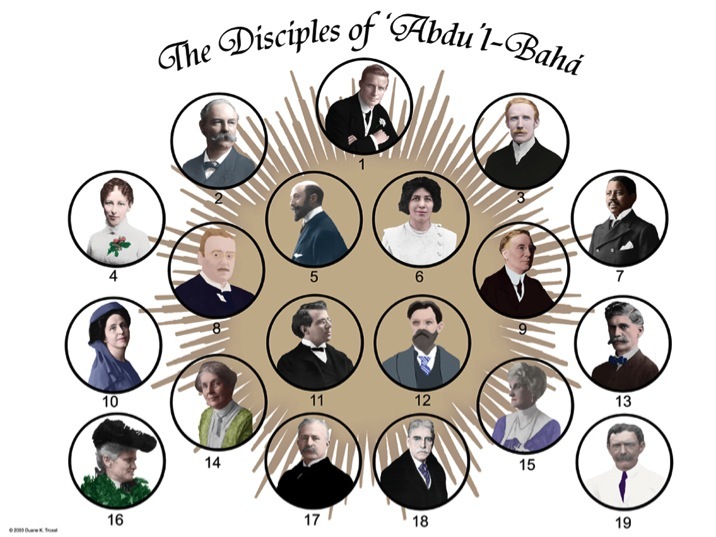 But somehow I think that we need to look at the whole group of individuals designated as Disciples of 'Abdu'l-Bahá, especially since a number of them are relatively unknown to most of us. It is so interesting to me that each of the Central Figures of the Bahá’í Faith (the Báb, Bahá’u’lláh, and ‘Abdu’l-Bahá) had a group of nineteen early believers associated with Him. Nineteen Letters of the Living: These early believers were the first to recognize the Báb and were designated by Him. They were all from Persia (Iran); one was female, the rest were male. These individuals were identified by Shoghi Effendi in Volume III (1928–1930) of Baha'i World (page 80). They were all from the East and all were male. 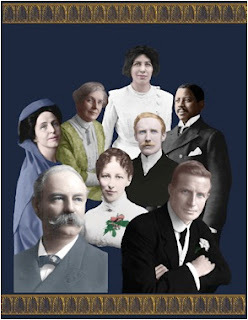 These individuals were also identified by Shoghi Effendi in Volume III (1928-1930) of Baha'i World (page 84). They were all from the West; six were female, thirteen male. Note: The number nineteen has special significance in the Bahá’í Faith. The Bahá’í calendar system is based on a solar year, with nineteen months of nineteen days comprising the year (with an additional four “intercalary” days, making a total of 365 days). Nineteen is also considered a “vahid,” or special unit of measure, in the Bahá’í dispensation. Two lists naming the Disciples appear in Volume III (pp. 84–85) and Volume IV (pp. 118–19) of The Baha'i World. Duane Troxel, whose 2004–05 calendar features the Disciples, says this: "All of the disciples were from the West. Fifteen were born in the U.S.; most were from the east coast. Of the remaining four, one was from Scotland, one from Canada, one from France, and one from Germany. Four of the 19 had medical degrees. Six of the 19 were female, 13 were male. Twelve of the 19 made their declaration of Faith in the 19th century." Wouldn't you love to be described as 'Abdu'l-Bahá's beloved?